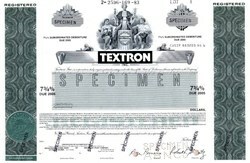 Beautifully engraved certificate from Textron Inc. printed in 1983. This historic document was printed by the American Banknote Company and has an ornate border around it with a vignette of an allegorical woman and two men. This item has the printed signatures of the Company’s Chairman, and Secretary, and is over 28 years old. Textron started as a small textile company in 1923, when 27-year-old Royal Little founded the Special Yarns Corporation in Boston, Massachusetts. Revenues that first year were just $75,000. Today that company has grown into a highly successful multi-industry enterprise recognized for our network of powerful brands, world-class processes and talented people. Textron Inc. is an $11 billion multi-industry company with 49,000 employees in 40 countries. The company leverages its global network of businesses to provide customers with innovative solutions and services in industries such as aircraft, fastening systems, industrial products and components and finance. Textron is known around the world for its powerful brands such as Bell Helicopter, Cessna Aircraft, Kautex, Lycoming, E-Z-GO and Greenlee, among others. Textron (NYSE: TXT) is a conglomerate that includes Bell Helicopter, E-Z-GO, Cessna Aircraft Company, and Greenlee, among others. It was founded by Royal Little in 1923 as the Special Yarns Company, and is headquartered at the Textron Tower in Providence, Rhode Island, United States. With total revenues of $14.2 billion, and approximately 37,000 employees in 29 countries, Textron is currently ranked 220 on the Fortune 500 list of largest companies for 2010. Royal Little, a Harvard graduate and veteran of World War I, founded the Special Yarns Company in 1923 with $10,000. With over 19 million spindles, Special Yarns Company saw early success in the niche market of synthetic yarns. Special Yarns Company acquired Franklin Process Company, a cotton yarn processing company in Rhode Island in 1928. This was the first merger of what would ultimately become Textron, the first multi-industry company. By 1930, Special Yarns sold about 4% of all rayon used in the United States, and the company changed its name to Atlantic Rayon. In 1939, the Lawrence Manufacturing Company was added. The Board of Directors authorized the investment of $100,000 to form the Atlantic Parachute Corp in 1942, which manufactured parachutes for the United States Government. This marked a significant change for the company – from a small yarn dyeing and throwing business, to a major manufacturer of finished, sewn products. Sales tripled in the first two years, and employees increased from 900 to 3,000. By this time, silk was no longer available in enough supply to keep women in hosiery. Now markets turned to the same synthetics used to produce parachutes for the war fighting men abroad. Unfortunately, rayon made for a baggy stocking, and a bare-legged fashion began. Little remained undaunted, however, and used these machines to produce blouses, men's underwear, bedspreads, and draperies. But with these new products came the need for a new name. After considering "Senorita Creations," "Textron" (“Tex" for "textiles," and "tron" for "synthetics") became the official name. To support the growing business, Little purchased several additional textile mills during the same period. In 1947, Textron was listed on the New York Stock Exchange for the first time, under the ticker symbol TXT. Little was realizing in 1952 the inevitable highs and lows of a company focused on one market. He realized that by diversifying the product offerings of Textron, he could balance the fluctuation of any single market. By purchasing relatively small companies in a variety of industries, he reasoned, he could also avoid any concerns by the Federal Trade Commission that he was forming a monopoly. Textron’s first purchase outside the textile industry was Burkhart Manufacturing, which produced cushion materials for the automotive industry. Next came Dalmo Victor Company, which produced radar antennas. Today this group is part of the Bell business segment, and produces electromagnetic defense systems for aircraft. From these early days, acquired companies were taken on as divisions, not subsidiaries. This eliminated the boards of directors for these companies, and allowed revenue generated by the divisions to flow directly to Textron. In 1955, Textron acquired American Woolen, significantly increasing its net worth and stock price, and, in just a few months, Ryan Industries (maker of mechanical and electromechanical devices such as a pistol that fired triangular bullets), Homelite (chain saws, power generators, blowers, and pumps), Camcar Screw and Manufacturing Company, Coquille Plywood, and Kordite Company (plastic clotheslines, garment bags, and shower curtains). A rather unusual acquisition for Textron came in 1956 when it purchased the 18,500 ton troop ship, the SS LaGuardia, refitted it as a cruise ship, and rechristened it the Leilani. The maiden voyage of the new ship was a disaster, however, because of inadequate plumbing and food poisoning. In 1958, Textron abandoned the ship to Maritime Commission. In 1956, Rupert C. Thompson, Jr., who had been director and chairman of the executive committee and head of Textron’s non-textile operations, was named to succeed Royal Little as president. Little remained chairman of the board and CEO. Textron continued its acquisition of several small companies in the next few years. In 1960, however, Little purchased Bell Aircraft Company for $32 million in cash. The purchase brought all of Bell’s real estate and three divisions: Bell Helicopter of Fort Worth, Texas (manufacturer of military and commercial helicopters), Bell Aerosystems of Buffalo, New York (designer and producer of rocket engines, inertial guidance systems, space components, automatic landing systems, and avionics devices), and Hydraulic Research and Manufacturing of Burbank, California (producer of electro-hydraulic valves and servo control systems). Combined, this division was known as Bell Aerospace. Already a well-known name in the aviation industry, Bell became a household name with the success of the Bell 47 helicopter and its use in films such as MASH. During the Vietnam War, Bell produced more than 10,000 UH-1 Hueys. Meanwhile, Bell Aerospace helped power the Gemini spacecraft, and produced the post boost propulsion system for the Minuteman III intercontinental ballistic missile. Throughout the 1960s and 1970s, Textron branched into a wide variety of industries: photocopy paper, pharmaceuticals, fiberglass boats, men’s dress shoes, crystal, and finally golf carts. Textron purchased E-Z-GO Car Corporation, the oldest golf car manufacturer in the business, in part because of Little’s devotion to the game. In 1961, Royal Little retired, severing his official ties to Textron. Little remained active in the business world, setting up a small investment company called Narragansett Capital, and writing articles for Fortune. Little died in 1989. Textron’s 1960 annual report described “new patterns for growth” for the company. To this end, Thompson divided all of Textron’s holdings into specific divisions: Automotive, Consumer, Defense, Industrial, and Textile. Over time, these divisions were rearranged as the Automotive Group took the name Industrial, and the Industrial Group became the Metal Product Group. The Textile Group soon disappeared entirely, and Defense became Aerospace. In the 1970s, the first non-manufacturing group was added: the Creative Capital Group. In 1963, Textron sold its last textile group. A further significant change came in the 1960s with the addition of the Employee Stock Savings Plan. Now employees could contribute up to 10% of their base salary to the Savings Plan, and Textron would contribute an amount equal to one-half of these payments. By 1978, employee-owned stock represented 17% of Textron’s Common stock. Following Little’s example, Thompson retired at age 63 and turned leadership of the company over to company president Bill Miller. Acquisitions under Miller included snowmobile maker Polaris, Australian card maker Valentine Holdings, and the venture capital firm American Research and Development Corporation. Miller's tenure at Textron ended in 1977, when President Jimmy Carter nominated him to be Chairman of the Federal Reserve. He later served as Secretary of the Treasury for President Carter. Joseph Collinson succeeded Miller as Textron's chairman and CEO. From the 1960s through the 1980s, Textron's management philosophy remained relatively constant. The corporate office, for the most part, maintained oversight of operational issues. During this time business units operated autonomously and corporate staff was small. Oversight by the corporate center was handled by a rotating group of corporate officers called Group Vice Presidents. In 1979, Collinson retired, and he was succeeded by Robert P. Straetz as chairman and CEO. Beverly F. Dolan, founder and former president of E-Z-GO, was president. By the end of 1979, revenues had risen to $3.3 billion. Textron acquired Avco Corporation of Connecticut, a conglomerate of almost equal size with pre-acquisition revenue of $2.9 billion in December 1985. Created by the Embry-Riddle Company as a holding company to acquire airlines, Avco held interests in more than 90 companies, including American Airways, predecessor of American Airlines. Four years later, Dolan recruited James F. Hardymon as Textron's new president after a 28-year career at Emerson Electric, where he had most recently served as president and chief operating officer. One of Hardymon’s first moves was the acquisition of the Cessna Aircraft Company, a leader in light and medium-sized commercial business jets. Now Hardymon needed to increase corporate oversight of operations. He brought in Lewis B. Campbell, an executive from General Motors, as executive vice president and chief operating officer in 1992. In 1994, Campbell was elected president. From 1989 through 1997, Hardymon continued his goal to maintain consistent growth for the company, decreasing military contracts, insurance, and consumer products, and divesting “non-core” businesses. Meanwhile, he strengthened the Aircraft, Automotive, Industrial, and Finance divisions. In 1998, Campbell was appointed chief executive officer. Campbell divested Avco Financial Services. Beginning in 2000, Campbell led a company-wide restructuring program to increase efficiency of operations; the consolidation of several manufacturing facilities; outsourcing of non-core production; and divestiture of non-core units. Lewis Campbell has been a big proponent of Six Sigma and encourages its use throughout the company, even in divisions, like the legal group, where it is not traditionally used. Under Campbell's direction Textron today functions as what it calls a networked enterprise. Departing from the old model of a holding company that simply acquires businesses and leaves their operations unchanged, the networked enterprise helps facilitate the operation of strong, unique brands. This means that while Bell Helicopter and E-Z-GO serve very different markets with distinct brands and customer bases, they share many of the same business infrastructure resources such as information technology infrastructure and employee benefits. When Campbell took over the company in 1998, the shares of Textron stock (TXT) were valued over $45 per share (split adjusted price) and the company had a market capitalization of over $12 billion. The price fell to as low as $13/share in March 2003 after the economic downturn following the collapse of Internet companies and the terrorist attacks on the World Trade Center. Lower demand for helicopters and airplanes led to layoffs at Cessna Aircraft Company and Bell Helicopter. Forbes magazine, in 2004, named Campbell as the fifth worst performing CEO in the country. Shares in Textron fell to as low as $10.09 a share in the economic downturn of 2008 driving its market capitalization to just $3.17 billion. While the company lost 75% of its value in the first ten years of Campbell's leadership, he managed to take home over $120 million in compensation. His salary in 2008 was $25 million, making him the highest paid executive of a conglomerate. Campbell managed to sell over $40 million in TXT stock in April and May 2008, at prices over $60/share. Textron was named one of America's Safest Companies in 2008 by Occupational Hazards magazine, a national publication for occupational safety and health professionals. The award is presented annually and recognizes companies for outstanding safety processes, health and training programs as well as a strong commitment from management and employees. Researchers at the University of Massachusetts Amherst have identified Textron as the 60th-largest corporate producer of air pollution in the United States, with roughly 600,000 pounds of toxic chemicals released annually into the air. Major pollutants indicated by the study include chromium, nickel, and manganese. Textron Systems has received a US government award to build the first 100 kW solid-state laser. Jacobsen turf maintenance equipment was used to maintain many of the stadiums that hosted the 2006 World Cup in Germany. The V-22 Osprey, a revolutionary tiltrotor aircraft, received approval for full-scale production from the U.S. Department of Defense in 2005. Cessna Aircraft Company in 2006 announced a feasibility study for a new low-cost, light-sport aircraft. As a result of the study the company announced the production of the $109,500 Cessna 162 at the AirVenture air show in Oshkosh, Wisconsin, where they sold over 700 copies of the plane in one week. One of Textron's subsidiaries, Textron Systems, produces and sells cluster munition. Thus, it is illegal to invest in Textron in Belgium, Ireland, Luxemburg, New Zealand, Lebanon, Malta, Mexico, Norway and Rwanda. More than 100 countries worldwide condemn the use of cluster bombs.